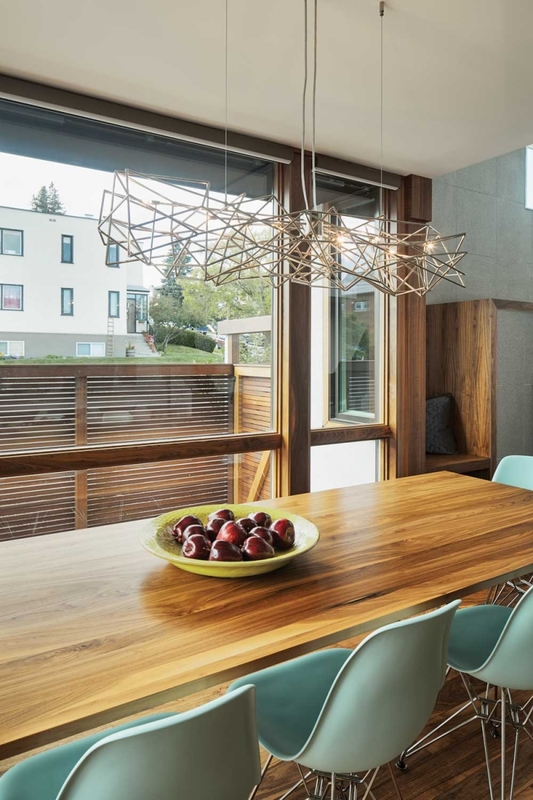 A blended family brings function and style to their infill property in southwest Calgary. When Michelle Van Raay began planning her dream home in Marda Loop, functionality was the first thing on her list of priorities. Van Raay, a doctor, needed a home that would meet the current and future needs of her blended family of five, including her partner, Tom Everest, Van Raay’s 11-year-old twins, Sophia and Agatha, and Everest’s seven-year-old daughter, Arielle. 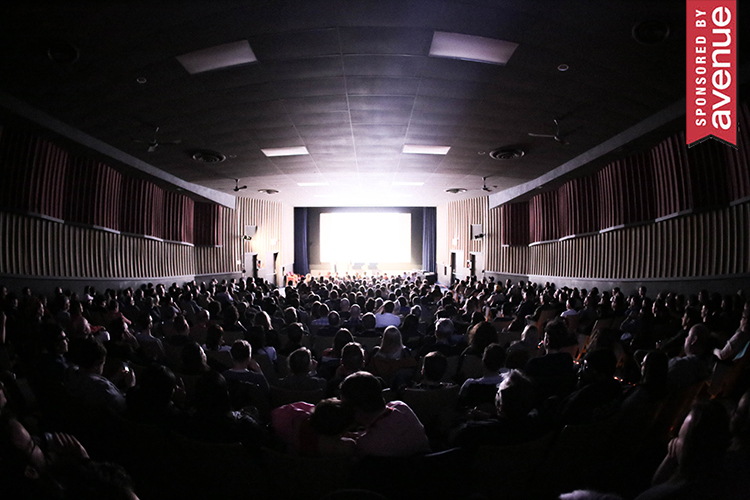 “It was kind of a compromise between, ‘Yes, we want our own space, but we also want to interact with each other,’ and, ‘We want to be close to each other’,” says Van Raay. Both Van Raay and Everest were conscious of the fact they didn’t want a home that felt too “big.” Working together with principal designer Sean Crawford, formerly of Shearer Design, the couple focused on making every square inch of space in the modern 2,000-square-foot infill they were building count. “When you put five people into the house without anything feeling crammed, most of the spaces need to be high-utility,” says Everest. 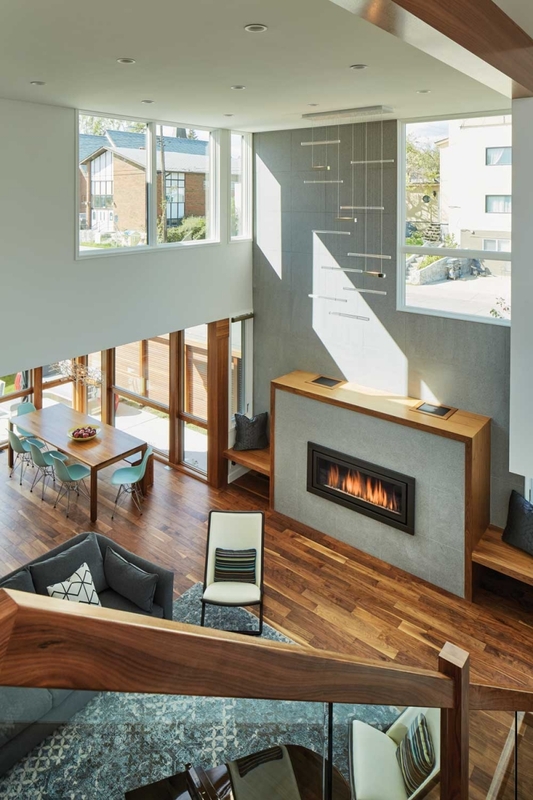 Homeowners Michelle Van Raay and Tom Everest wanted to make sure that their Marda Loop infill reflected their unique personalities. “I don’t want to live in a house that looks like everyone else’s house on the street,” says Everest. An eye-catching Batu wood fence inspired by a nearby Starbucks coffee shop and landscaping that includes different species of native grasses give the property plenty of curb appeal, but the home’s interior is where the family members’ personalities really shine through. Van Raay’s 11-year-old twin daughters, Agatha and Sophia, are talented piano players, and music is a passion shared by the entire family. Instead of including a television in the main floor living room, a baby grand piano is the focal point, which Van Raay and Everest say reflects one of their family’s core values. “Music is a very big piece of everyone’s life in the house,” Everest says, adding the stereo speakers installed throughout the home are another one of his favourite features. According to designer Sean Crawford, Van Raay’s vision for the home’s interior was for a practical, comfortable space injected with a “touch of fun.” It was her idea, he says, to paint the front door a cheerful blue after he suggested blue for the durable chairs in the dining area and the insides of many of the kitchen cupboards. When Michelle Van Raay purchased a narrow lot in Marda Loop, she wanted to maximize the usefulness of her infill property. Like many urban dwellers, one significant challenge Van Raay, her partner, Tom Everest, and designer Sean Crawford had to consider was how to create a bright and beautiful home within the constraints of the existing lot. Van Raay, explains Crawford, was adamant that her house maximize interior volume without necessarily increasing the square footage – especially with three children under the age of 12. “I think it’s good to be … close to your family,” says Van Raay, adding it is nice to be able to have conversations with her daughters without needing to shout across an expansive home. White walls, oversized windows and high ceilings make the living space seem much larger than its 2,000 square feet, and the open-concept kitchen, living and dining areas provide plenty of space for the blended family of five (including Everest’s daughter, Arielle, seven) to enjoy together. 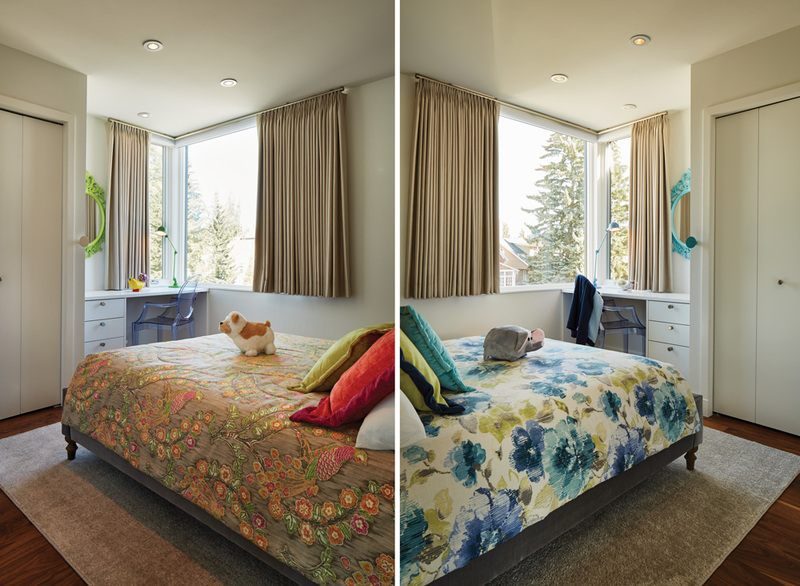 Preteen twins Agatha and Sophia infused their own personal style into their complementary spaces by painting the same IKEA mirror in vibrant shades of their choice and selecting different bedding colour schemes and styles. 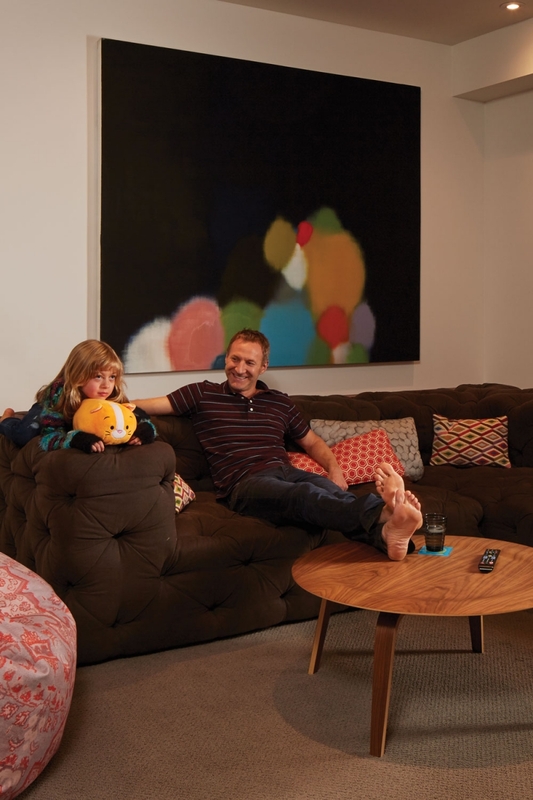 Oversized artwork and plush seating make the basement family room a cozy haven. Feminine floral prints add a touch of whimsy to seven-year-old Arielle’s bedroom. 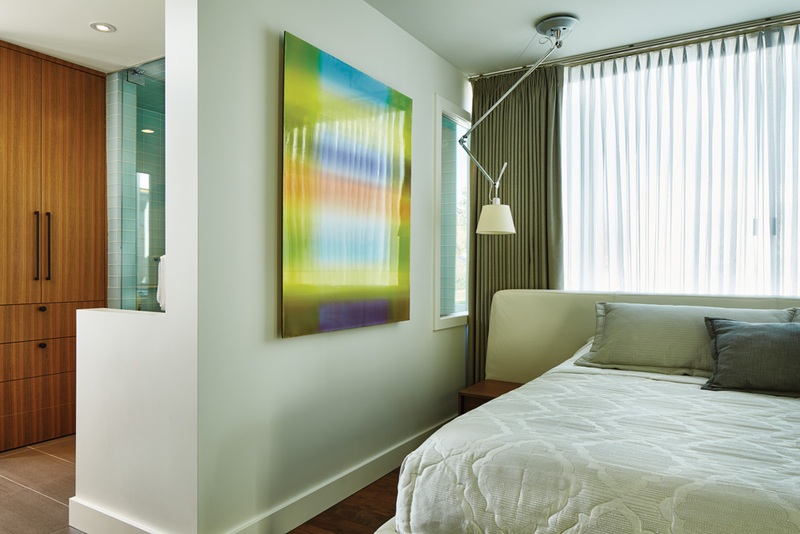 The master bedroom boasts a number of tech-friendly features, including programmable blinds. 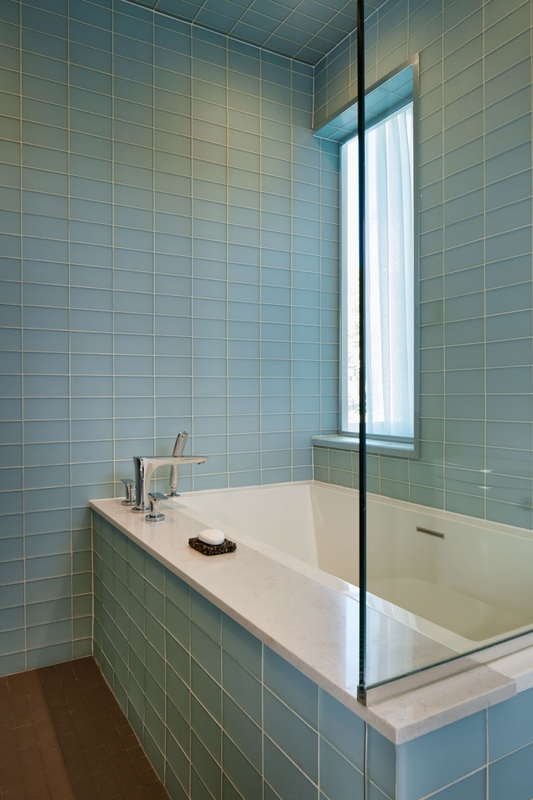 Light streams into the master bathroom via two windows – one facing outside and one facing the bedroom. “Built-in appliances allow for a clean, uncluttered look,” says designer Sean Crawford. 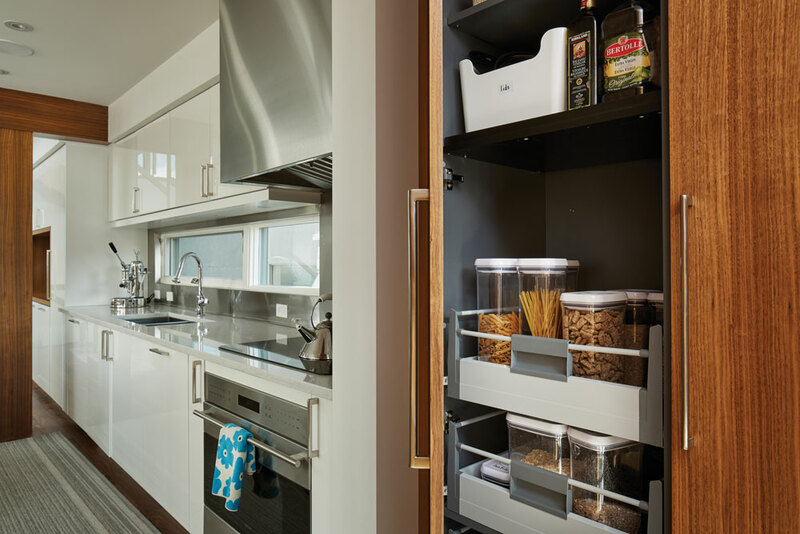 Concealed drawers allow for the function of multiple pull-outs, but maintain the clean look of one door. A double height ceiling and large windows give the main living area a spacious, dramatic feel. Van Raay loves the aqua-coloured chairs in the dining area, which inspired splashes of blue throughout the family home. Designer Sean Crawford shares his tips on creating a beautiful and functional space. “It is no fun when that enamel stock pot doesn’t have a home!” Crawford says. Built-ins and cabinetry should always be purposeful, so think carefully about which items need to be stored in particular places. “I tend to appreciate timelessness and quality in the big-ticket items – cabinetry, flooring and even sofas,” Crawford says. He advises that, when you keep the canvas of your home consistent, it is easy to add drama and visual “pop” with well-chosen accent pieces and soft furnishings.